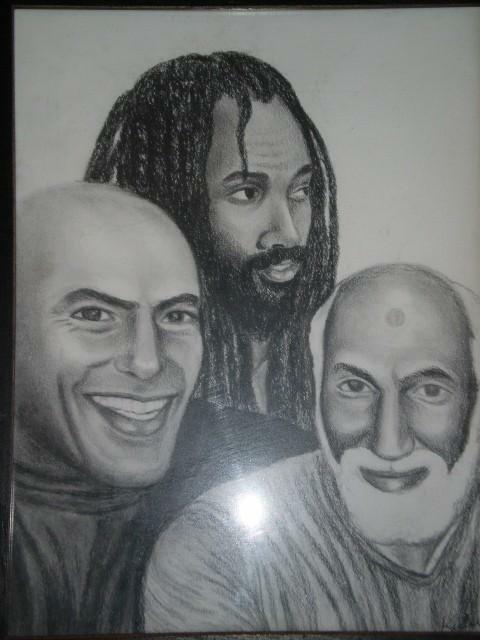 ARTWORK BY KIILU NYASHA: From left to right: Hugo "Yogi Bear" Pinell, Mumia Abu-Jamal, and Albert "Nuh" Washington. One of the most egregious cases of prolonged torture is the politically-charged isolation of Hugo Pinell still held in Pelican Bay’s SHU after nearly 20 years. For his active resistance back in the 1960s and assault conviction in the San Quentin Six case (1976), my dear friend has spent a total of 40 years in hellholes – 45 of his 64 years in California prisons. (http://www.hugopinell.org). --Angola 3 News is a new project of the International Coalition to Free the Angola 3. Our website is www.angola3news.com where we provide the latest news about the Angola 3. We are also creating our own media projects, which spotlight the issues central to the story of the Angola 3, like racism, repression, prisons, human rights, solitary confinement as torture, and more. Our online video series has now released interviews with Robert King and Terry Kupers entitled “The Psychological Impact of Imprisonment,” Black Panther artist Emory Douglas entitled “The Black Panther Party and Revolutionary Art,” author J. Patrick O’Connor entitled “Kevin Cooper: Will California Execute An Innocent Man,” author Dan Berger entitled “Political Prisoners in the United States,” and Colonel Nyati Bolt entitled “The Assassination of George Jackson.” Please help spread the word!